“Did you see that thunderstorm last night?" We're still not sure, but — anecdotally, anyway — the jury is in: The summer AAS meeting in Denver hit our collective happy spot, with its central location on a pedestrian mall with a real range of dining, lodging, and shopping options; easy access ($9 train ride and free mall bus) to the airport in West Kansas (OK, maybe it’s not that far); jogging along Cherry Creek; spectacular and sometimes loud weather; and a view of the Rocky Mountains. 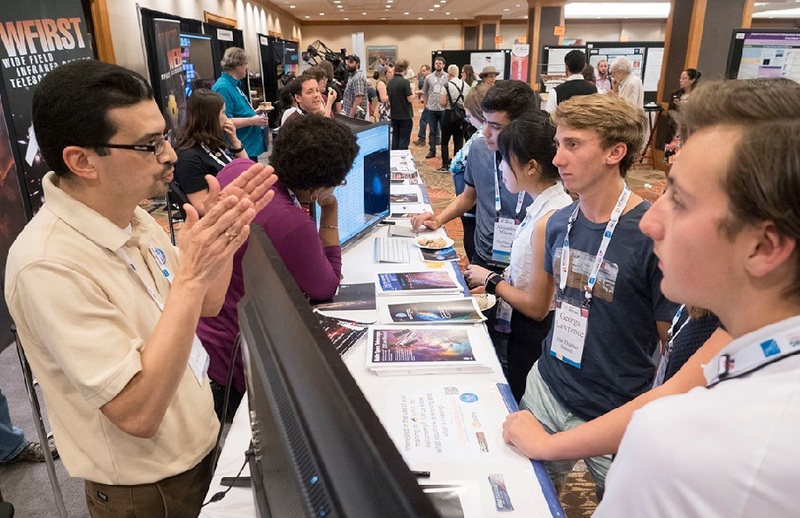 AAS summer meetings are always smaller than winter meetings, but this one had a very nice mix of big science plenaries, special topics, and mini-meetings; iPosters and print posters; and discussion topics from astronomy to public policy and social science. There were even high-school students chatting with grey-haired agency types, some of whom I saw chilling sans dress shoes in the display area, which had proper carpet — and that makes a difference for the feet, folks! The venue was compact, with a casual feel. I actually could walk around and find people more than once, you know, unlike other meetings, where you see that friend you haven't seen for years and say, "I'll be here all week!" and you never see them again. Not so in Denver! It was possible to have real conversations and meet up and re-connect, talking science and life and all that. I'm biased. So Kevin Marvel is counseling me to take a proper cooling-off time-out and wait for the evaluation of the attendee survey. I'm sure we can do better and make improvements, and that we’ll do. But Denver? It's a keeper!